You simply call the office to schedule your QEEG Brain Map. We also regularly offer free Neurofeedback information sessions – Click Here – for more information. 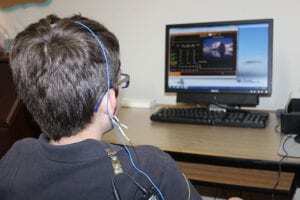 What does the Process of Neurofeedback Involve? The first step involves conducting a QEEG Brain Map; this is a procedure where EEG activity is recorded and statistically analyzed. You then meet with Dr. Roseann to review your brain map and make a treatment plan. After a protocol has been designed, you can immediately begin your Neurofeedback sessions. The number of sessions required vary based on each individual, but range from 20 to 100 or more sessions. * Most individuals come in two times per week. A session involves placement of sensors on the scalp and ears while getting brainwave reinforcement as you watch a movie. How Do You Know Which Therapy I will Need? After a QEEG, Dr. Roseann will sit down with you and review your results and make treatment recommendations. Based on your QEEG results and clinical intake, she will determine what therapy or therapies is/are best.